The Life Sciences Honors Thesis Award Program will not be offered in 2016-17. The information on this page is provided for reference purposes only and describes program parameters from 2014-15. To support the completion of Honors theses in the life sciences, the Honors Program has provided funding for up to twenty awards to Honors thesis researchers in academic year 2014-15. Funding is provided only to defray laboratory costs or to purchase consumables essential to the execution of undergraduate research leading to the completion of the Honors thesis. Awards of up to $1,000 per student will be provided. Please note: Recipients of SURF Awards in Summer 2014 or OUR Supply Awards in Fall 2014 or Spring 2015 are eligible only for a maximum of $500 from the Life Sciences Honors Thesis Research Award in 2014-15. A student majoring in Biological Sciences, Ecology and Evolutionary Biology, Molecular and Cell Biology, Pathobiology, or Physiology and Neurobiology. 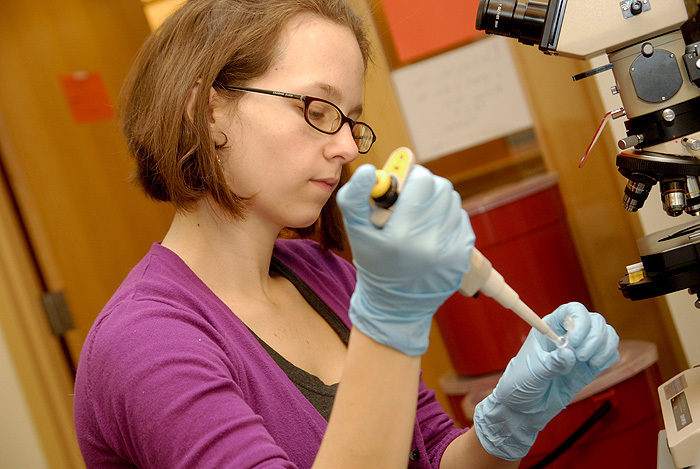 A student with another major who is supervised by a faculty member with a primary appointment in one of the CLAS biological science departments (EEB, MCB, PNB) or CAHNR Pathobiology. A student with another major who is engaged in life science research for his or her Honors thesis who is supervised by a life science faculty member based in another department, school, or college (e.g., a student conducting neurobiology research in Psychology, a student conducting life science research in Animal Science). For guidance on what is considered a “life science” field, refer to the NSF graduate research fellowship program categorization. In addition, students must be members in good standing of the Honors Program and must plan to graduate as an Honors Scholar or University Scholar by May 2016. During each semester when award funds are utilized, the Honors student must be enrolled in at least 1 credit of Honors coursework (e.g., independent study, thesis research) under the supervision of the thesis supervisor. The student will submit a Research Experience Completion Form as confirmation of the execution of the research experience by Friday, April 17, 2015. Students who received a SURF Award in Summer 2014 or an OUR Supply Award in 2014-2015 may apply for a maximum Life Sciences Honors Thesis Award of $500. Students who receive a Life Sciences Honors Thesis Research Award will participate in the Frontiers in Undergraduate Research Poster Exhibition in the spring of the academic year in which they receive their award. Award recipients graduating later than the spring of the award year may elect to present at Fall Frontiers or at the spring Frontiers exhibition immediately preceding their graduation. If the student does not complete the Honors thesis, the faculty advisor will be asked to submit a report to the Office of Undergraduate Research providing his or her assessment as to why the student did not complete the thesis. The Life Sciences Honors Thesis Award Program will not be offered for 2016-17. The online application for the Life Sciences Honors Thesis Award closed at 4:00pm on Monday, September 29, 2014. Although two rounds of applications were planned for 2014-15, the fall round generated a high volume of strong applications and all available funding has been committed. There will be no spring 2015 application cycle. Students seeking funding support for thesis research project supplies should consider applying for an OUR Supply Award. Your application will be submitted online and you will be asked upload a Budget worksheet (PDF format) that presents your budget in detail. Get started by reviewing the LSHTA Application Outline. The outline provides you with all the questions you will need to answer and the information that will be collected in the online application. Your research advisor must complete the LSHTA Faculty Recommendation Form in support of your project and submit it directly to OUR by the deadline. Thesis supervisors are asked to complete the LSHTA Faculty Recommendation Form and submit it directly to OUR. Please return this form via fax (6-0222), campus mail (Attention: Jodi Eskin, OUR, U-4147), or email from your UConn account to our@uconn.edu. Your assessment of the quality of the student’s work to date and the necessity of this funding for the completion of the proposed project are critically important to the review process. Please note that award funds for Life Sciences Honors Thesis Awards are transferred to a ledger 2 account associated with the thesis supervisor or his/her department for use in accordance with the budget submitted by the student. Any questions or concerns about recommendations or arrangements related to LSHTA should be emailed to our@uconn.edu. You may also contact OUR by calling 860-486-7939 – we are happy to answer any questions you might have! The project description is well written and clearly explains the thesis project. The student has secured or is securing research compliance approval(s) if necessary for the research. How are Life Sciences Honors Thesis Awards disbursed? I am conducting (part of) my thesis project at the UConn Health Center. Am I eligible for this award? Does receiving a Life Sciences Honors Thesis Award affect my eligibility for other OUR awards? I have questions about the Life Sciences Honors Thesis Award. Is there someone I can speak with? Award funds for Life Sciences Honors Thesis Awards are usually transferred to a ledger 2 account associated with the thesis supervisor or his/her department for use in accordance with the budget submitted by the student. Yes, you are eligible for this award. We will work with you to make the appropriate arrangements for disbursement of the award funds as they cannot be transferred to the UConn Health Center. Students traveling to the UConn Health Center may receive all or part of their award funding to cover their travel expenses. No. This award is intended to support expenses that are specific to a student’s project and consumed through use in the student’s project. Physical items (e.g., pipettes, reagents) and time using particular equipment or resources (e.g., confocal microscopy time, cloud computing time) are allowable expenses. If you have questions about whether an anticipated expense is allowable under this award program, please contact our@uconn.edu. A student may receive a maximum of $1,000 in research supply funding during a single year, with the year starting in the summer and concluding with the spring semester. If you receive a $1,000 Life Sciences Honors Thesis Award, you become ineligible for an OUR Research Supply Award during that year. A student could receive a SURF Award, an OUR Research Supply Award, and a Life Sciences Honors Thesis Award in the same year, but the combined amount of research supply funding would not exceed $1,000.